DYNAMIX 4RU Universal Swing Wall Mount Cabinet. Removable Back mount DYNAMIX 4RU Universal Swing Wall Mount Cabinet. Removable Back mount supplied with Left & Right Hinges (600 x 450 x 281mm). Includes 10x nuts. Gloss black colour. DYNAMIX 6RU Universal Swing Wall Mount Cabinet. Removable Back mount DYNAMIX 6RU Universal Swing Wall Mount Cabinet. Removable Back mount supplied with Left & Right Hinges (600 x 450 x 368mm). 1x Fixed 10 x cage nuts. Gloss black colour. DYNAMIX 6RU Universal Swing Wall Mount Cabinet. Removable Back mount DYNAMIX 6RU Universal Swing Wall Mount Cabinet. Removable Back mount supplied with Left & Right Hinges (600 x 550 x 368mm). Includes 2x 1 x fixed shelf, 10 x cage nuts. Gloss black colour. DYNAMIX 9RU Universal Swing Wall Mount Cabinet. Removable Back mount DYNAMIX 9RU Universal Swing Wall Mount Cabinet. Removable Back mount supplied with Left & Right Hinges (600 x 550 x 501mm). Includes 2x 1 x fixed shelf, 10 x cage nuts. Gloss black colour. DYNAMIX 12RU Universal Swing Wall Mount Cabinet. Removable Rackmount DYNAMIX 12RU Universal Swing Wall Mount Cabinet. Removable Rackmount supplied with Left & Right Hinges (600 x 550 x 635mm). Includes 1 x fixed shelf, 10 x cage nuts. Gloss black colour. DYNAMIX 12RU 600mm Deep Universal Swing Wall Mount Cabinet. Removable DYNAMIX 12RU 600mm Deep Universal Swing Wall Mount Cabinet. Removable Backmount (600 x 600 x 635mm). Includes 2x fans, 1x fixed shelf, 10x cage nuts. Gloss black colour. DYNAMIX 18RU Universal Swing Wall Mount Cabinet. 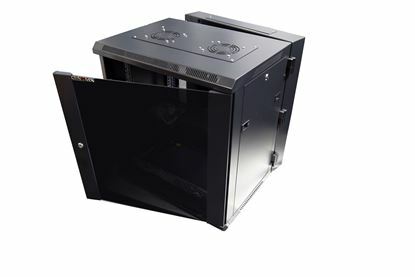 Removable Rackmount DYNAMIX 18RU Universal Swing Wall Mount Cabinet. Removable Rackmount supplied with Left & Right Hinges (600 x 550 x 901mm). Includes 2x 1 x fixed shelf, 10 x cage nuts. Gloss black colour. DYNAMIX 18RU 600mm Deep Universal Swing Wall Mount Cabinet. Removable DYNAMIX 18RU 600mm Deep Universal Swing Wall Mount Cabinet. Removable Backmount (600 x 600 x 901mm). Includes 2x fans, 1x fixed shelf, 10x cage nuts. Gloss black colour. DYNAMIX 24RU Universal Swing Wall Mount Cabinet. 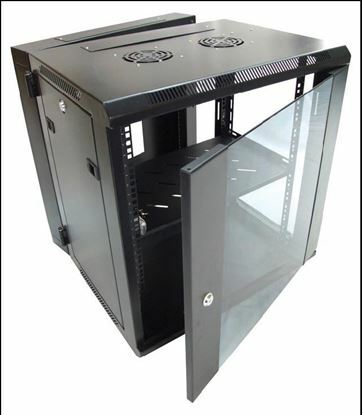 Removable Rackmount DYNAMIX 24RU Universal Swing Wall Mount Cabinet. Removable Rackmount supplied with Left & Right Hinges (600 x 550 x 1167mm). Includes 2x 1 x fixed shelf, 10 x cage nuts. Gloss black colour. DYNAMIX 24RU 600mm Deep Universal Swing Wall Mount Cabinet. Removable DYNAMIX 24RU 600mm Deep Universal Swing Wall Mount Cabinet. Removable Backmount (600 x 600 x 1167mm). Includes 2x fans, 1x fixed shelf, 10x cage nuts. Gloss black colour. DYNAMIX 27RU 600mm Deep Universal Swing Wall Mount Cabinet. Removable DYNAMIX 27RU 600mm Deep Universal Swing Wall Mount Cabinet. Removable Backmount (600 x 600 x 1365mm). Includes 2x fans, 1x fixed shelf, 10x cage nuts. Gloss black colour.